These pages are incorporated in the tab menu. Move the highlighted page from one list to the other. Adjust the order of the tabs in the tab menu. The following applies here: The higher a page is in the list, the further to the left it will be displayed in the tab menu in the browser. If you highlight an edit page in the "Selected pages" column, the "Create new record" setting is activated. With this, all elements on the edit page in the tabulator menu will be automatically loaded without data. View pages will simultaneously no longer be available, as all additional edit pages will be activated for data entry. 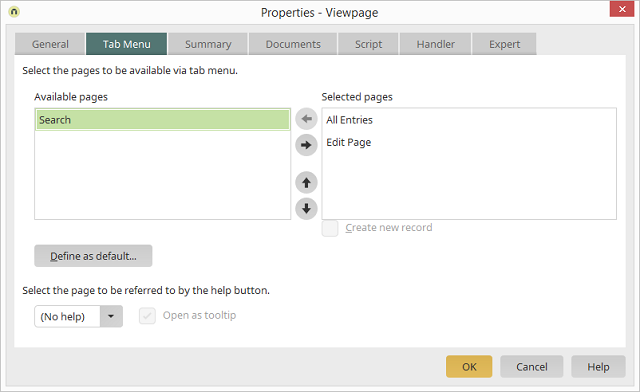 Opens a dialog where the tab menu configured here can be defined as the default. This default will be used on all integrated pages. Here, any view page from the application may be selected as a help page. In the browser, to the right of the tab list in the tabulator menu, a "Help" icon will be shown, which will open the help page in a new window. If this setting is selected, the help page will be displayed in a tooltip. If the setting is not selected, then a popup will open for the help page.